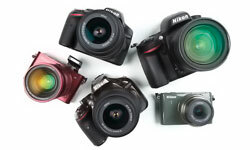 What camera equipment is necessary to get the photos you expect to come home with? Capture Africa Tours welcomes all photo enthusiasts no matter what your photographic skill level. Your equipment plays an important role in the type of images you can create. Many of you have invested in your own equipment and have everything you need. For those of you who wish to have additional camera bodies, longer lenses, etc… and choose not to buy, we suggest renting equipment from Borrowlenses.com. They have every major brand in their inventory and will ship anywhere in the USA in time for your trip departure. Remember, insurance is required on all rentals and this can also be obtained from Buymyinsurancenow.com. To help you prepare for the trip, here are some suggestions for equipment. Camera Bodies: I always suggest taking two camera bodies on your African tour – One for a telephoto lens and another good quality point and shoot with a wide angle-mid zoom when animals get very close…and they will! Having a second body enables you to shoot landscapes and other environmental images without changing lenses. Changing lenses in the field or in your vehicle increases the chance of getting dust on your sensor. Lenses: I suggest full coverage from wide angle to telephoto. Canon and Nikon have new 200-400mm zoom lenses that have excellent image quality. Consider bringing a 300mm or longer, if possible, because you will not always be at the perfect distance. The faster the lens the better. If you do not understand what I mean by “faster” it has to do with the lens aperture. These are all things that will be discussed on the trip but you are welcome to email me or call me personally and I will be happy to discuss what to bring. Extenders: The use of teleconverters is a great way to add length to your existing lens without draining your bank account. My only advice if you decide to buy one is purchase the same brand as the lens you own. Also it is my opinion that the 1.4x extender is better quality than the 2.0x extender. I am sure there are people that will debate this…..and that is OK! Flash: External on camera flash units are allowed in the National Parks and Game Reserves, but night photography is not always allowed for ethical and safety reasons. Flash units can help tremendously during the day to fill in shadows and cut down on contrast, or add some punch in overcast conditions. 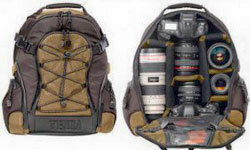 Camera Bag: A backpack camera bag is ideal for your airplane carry-on. You can keep your equipment safe and with you at all times. Keep in mind luggage carried on-board the aircraft, must be of a size and shape to allow for storage in aircraft overhead compartments, or underneath the seat in front of you. Each person is allowed to carry on-board the aircraft one piece of luggage and a personal item. Typically this luggage must not exceed 45 linear inches (9 inches by 14 inches by 22 inches) and also must not exceed 40 pounds. For more information on restrictions by airline check out Luggagepros.com. And check out our FAQ’s under “What Luggage To Bring” for more information. Beanbag/Tripod: You need stabilization to achieve the sharpest images. I suggest a monopod, a beanbag, and a light carbon fibre tripod. Chances are you will be using the bean bag most of the time, and when not using it, the ISO adjustment will compensate for any low light situations. A good source for beanbags is Vertexphoto.com. Media Storage: Your tour in Africa can generate very high volumes of images. 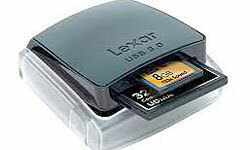 For this reason I recommend high capacity Compact Flash cards of good quality, such as Lexar and SanDisk. I do not encourage to compromise on quality and reliability when it comes to CF cards as you may run the risk of image/data corruption. CF cards in many cases will not be sufficient space or storage for your images. You will need external support to save your images. One option should be a laptop computer where you can download your images in the evening. 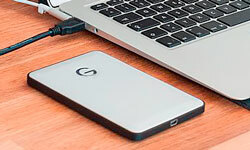 An external hard drive can also be your backup. We certainly recommend to save all your images in at least two places. Having a laptop with Adobe Lightroom, Adobe Photoshop, or software of your choice will give you the opportunity to view and do some basic editing on your images back at camp or your lodge. Card Reader: You need to have a process plan for downloading your images every day. You can either do this from a card reader or directly from your camera. It’s safe to have 2 of everything to assure your covered if something quits working or is damaged. 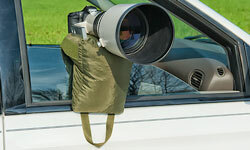 Other Accessories: Take a rain cover for yourself and your camera body and long lens if you are going to be there in the rainy season. While rain lasts for very short periods of time in Tanzania, the down pours are hard. Batteries and Charger: Have a minimum of 2 camera batteries’ per camera along with at least 2 chargers. Filters: Bring polarizing filters as well as a ND filter. I will use them for landscape shots. The clouds are awesome in Africa and polarizers will really add drama to your images. DO NOT bring any extra filters for lens protection. Extra glass to protect your expensive lenses just cuts down on the quality of your images. Lens Cleaning Solution and Wipes: Take cleaners and cloths for both your lenses and sensor (if you know how to clean your sensor) If you are not careful when changing lenses you can easily get dust on your sensor. But let’s not forget, an African safari is about experiencing a once in a lifetime event… that bucket list trip that will leave you with memories of a lifetime.